5 children out of 23 from 5th class of school in Amadagur can’t get scholarships because #AadhaarFAIL - Aadhaar FAIL! 5 children from a single class of of 23 students in a single government school in Amadagur, Andhra Pradesh will not get their scholarships this year. They have Aadhaar cards. But the Aadhaar cards have wrong data entered and even on correction, the new card still contains wrong data. As a result, the school is not able to open accounts at the bank for them to receive their scholarship money. This is in spite of the Supreme Court stating in 2015 that Aadhaar was purely voluntary and not mandatory and reaffirming in 2016 specifically that Aadhaar was not mandatory for scholarships. The practical problem was that Aadhaar was being made mandatory for bank accounts without which the scholarship could not be received. The government keeps putting out grand figures of savings due to Aadhaar linking, but over and over on the ground, the findings are that there are very few fake beneficiaries and the “ghosts” that the government reports proudly about and “saves” money by “blocking the leakage” of funds to them are over and over found to be real people being denied their rights in spite of qualifying and registering for various schemes due to problems caused by Aadhaar. On the other hand, actual ghosts can easily access govt welfare funds as long as they provide an Aadhaar number – even if it belongs to a fictional person like Lord Hanuman. 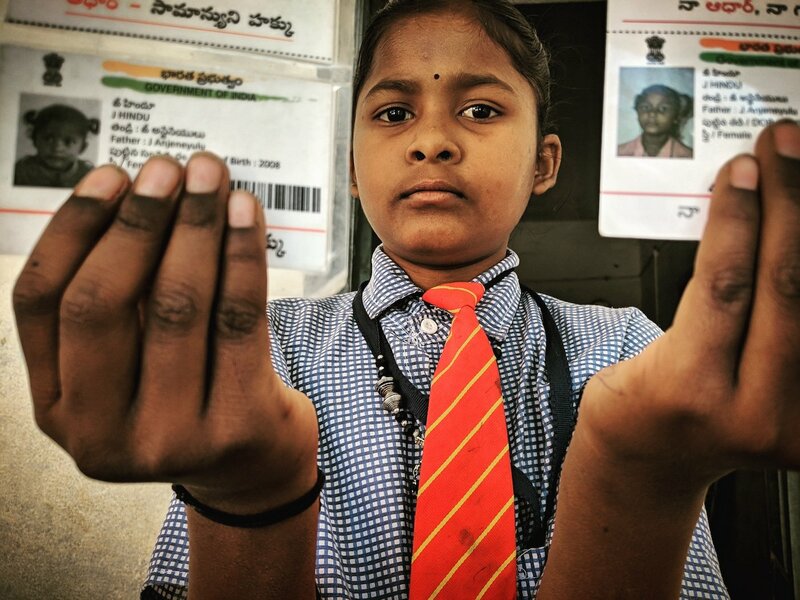 Update: A day after this story was published, UIDAI officials contacted the headmaster of this school to ask if their officials could come over and rectify the spelling names of the five children whose names had been misspelled on their cards.